Contact Details : Contact the Authorised Officer No : 0471-2338281. Schedule of Property : 08.19 ares of land and residential building in Re.Sy.No:745/1/2333 in Alayamon Village,Pathanapuram taluk,Kollam dist, Bounadries : East ; Road, South : Property of Mr.Suresh, North : Property of Mrs.Leela, West : Property of Mrs.Radhamani. 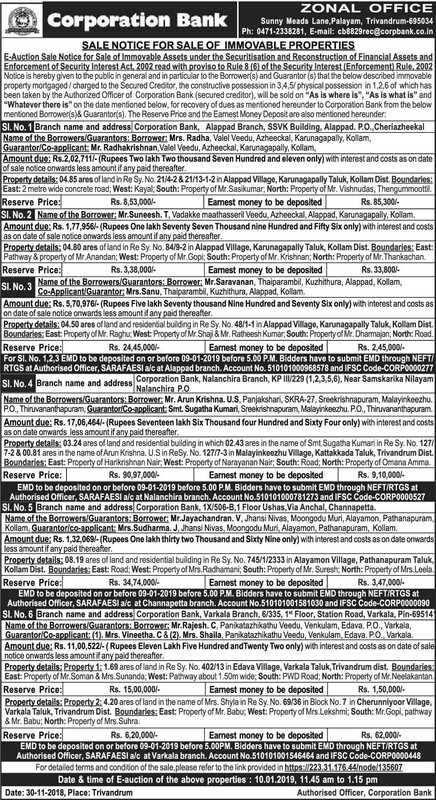 Inspection Details : For Inspection Details Please Contact the Authorised Officer No : 0471-2338281.